Thank God for the wonderful weather today, we could step out for a late bike ride. There was no sun when we left at 8.30 am and were hoping it stays behind the clouds. It was actually a bit chilly. What was also special about today was that we were biking together after nearly 4 months. So it was back to good old days, setting routes, cutting our way through residential colonies, and dodging the trucks and autorickshaws on the main roads. We had decided to go to Bellandur lake and come back via Sarjapur Outer Ring road. So we cut across the Old Airport road, reached Wind Tunnel road and took the army defence area to reach the Bellandur lake. Once past the Wind Tunnel road, we were away from the city traffic. The entire stretch from Wind Tunnel road to the Bellandur lake is also a very good candidate for morning runs. We wish to come here some day for a long run. One of those initiatives which are really making a difference in the lives of people. After plastic, paper and clothes, it is the turn of the humble cycle to be recycled in a bid to empower poor and needy children. Two Bangaloreans have been collecting unused and/or old cycles from across the city and repairing them before donating them to needy children. The duo — Pradeep V V, a co-founder of Mapunity.in, and Mayank Rungta, a software professional with Juniper Network India Pvt Ltd, set up the Ride A Cycle Foundation after reading of a similar initiative elsewhere. Pradeep says, “Last year, I came across a story about a doctor couple in Mumbai who would go around the city collecting old cycles and repairing them before distributing them among the needy. 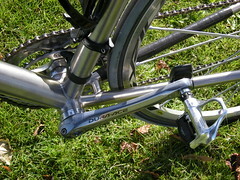 Their project is called the Bicycle Project. More info about Pradeep and Mayank’s initiative can be found at Cycle Recycle blog. In December, they provided the first set of recycled cycles to students of two NGOs. We went on a 26 km ride on a self-charted route this Sunday. We could not manage to participate in the GGI CM the previous day, so we decided to make up for it. 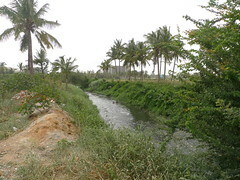 You can see the complete description of Sunday’s ride to Bellandur Lake on dailymile.com here. Official Announcement for the February event on 27th. It’s time again to celebrate the joy of cycling. This month we are taking some history lessons with cycling. Let’s ride towards one of the less famous towers of Kempegowda in Gavipuram Guttahalli. The tower is on a small hillock overlooking the Kembambudhi lake. If on time, we can view a beautiful sunset and move on the the Gavi Gangadhareshwara Cave temple. Both the tower and the temple were built by Kempe Gowda referred to as the founding father of Bangalore. We will be ending the ride at the VV Puram – Food Street and indulge in some carb loading. Really want to attend this. Have to get the final route map though, to make sure we don’t kill ourselves riding all over Bangalore in the middle of the afternoon. Google maps seems to suggest this car route. 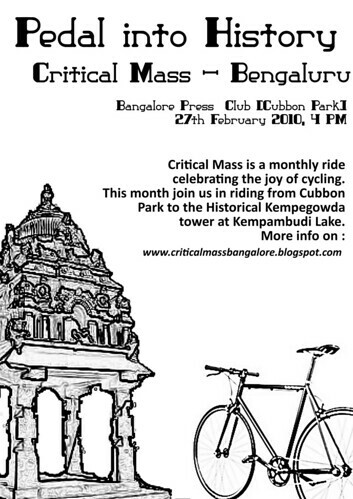 Distance from Cubbon park seems to be about 6-7 km. Just discovered this article on Sheldon Brown’s website. It explains a lot about why experienced cyclists pedal a lot differently (not just faster) from newbie cyclists (or normal urban cyclists). 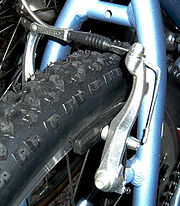 At first, some background about why V-brakes were the first thing I obsessed over in the first few weeks of owning a new bike. When I got my bike about two weeks back from BOTS, I faced the first of the logistical hurdles of a newbie cyclist. BOTS is about 20 km from my home, which in Bangalore is quite a respectable distance, and this entire distance is through some of the busiest roads of Bangalore. For a newbie cyclist like me (well not exactly newbie, but that is a separate story), this distance or at least the route is intimidating. So the only way to get my cycle home was in my car, which turns out to be one of the smallest cars on the Indian roads – the Maruti Alto. A friend of mine, Balaji, had mentioned earlier to me that I would probably need to take out the front wheel to fit the bike inside my car, but soon I found out that I had to take out both.